I’ve made yet another iteration of my simple keymap for Blender, this time compatible with 2.8. I’ve decided to be less humble this time and simply call it the Proper keymap for Blender 2.8, since current default 2.8 keymap leaves much to be desired, and industry standard one is still not released, and shaping up to be a missed opportunity. My keymap is simply superior, since I’ve put way more thought, time and effort into it than anyone at Blender Foundation ever will. No more reaching for frequently used zoom selected feature somewhere on the numpad . button, or performing hand gymnastic every time you want to do inset while modeling. The more frequent and important the features are, the easier they are to reach. The most used features are right at your fingertips, concentrated around Left Alt Key. I’ve put lots of thought into making workflows as fast possible. All the modeling and transform tools are concentrated on one place, allowing for very rapid modeling. They tools are no longer scattered on random keys all over the entire keyboard. Same goes for pretty much all other editors. Related features have been mapped to related keys. This means extreme amount of consistency between different editors, therefore allowing you to use same muscle memory in all of them. The keymap comes with view switching pie menu layout that actually makes sense, unlike the default one. Almost all of the features that aren’t used only rarely are mapped on first level keys (no modifier keys) or 2nd level keys (one modifier key combination). No more crazy Ctrl+Shift+Alt combos. This keymap makes Blender behave way more like a common sense software. While there were some efforts to achieve that also in official 2.8 keymap, this one is way better at it. No need to switch between select and transform tools. They all work together. You can select while in move tool, and so on… At the same time, you are not missing out on rapid transform tool usage, as tweak operations can still be easily performed using RMB. On top of that, RMB context menu remains working as 2.8 can differ between drag and click operations. This keymap actually works, in all the editors, unlike the default one. Go to User Preferences, Addons tab, search for Essential Keymap Tools addon and enable it. Go through the key binding list and click “Restore” button anywhere you see it. So for anyone who is interested in not just using Blender, but using if efficiently, and working in the flow, this is THE keymap to use. There may still be some things I’ve forgotten to update or some little bugs in the keymap. If you come across any, please let me know in this thread and I’ll fix them asap. Fixed LMB select and click to deselect broken with one of the recent builds. Printable Blender 2.8 keymap out there? … did you made this keymap also considering linux users ? well, I might know some that could raise the question, but anyway, thank you for your work and your answer. This is a great idea, and we’re very much on the same wavelength. I do hope they make editing the keymap easier. Have you considered conflicts with some commonly addon used hotkey? For example, HardOps uses the q key. Here’s something I’d like to suggest implementing. Key combination tweaks for various actions. For example, I have pie menu for orientation set to W,E,R + LMB so that I can access it modeling, uninterrupted. This also frees up the Ctrl+Q key. I also have general tweak set to MMB and Pan set to Alt + MMB - this way I don’t have to lift my alt thumb, but this my just be my personal preference. I’m interested to hear what you think about keeping Alt on for navigation purposes. 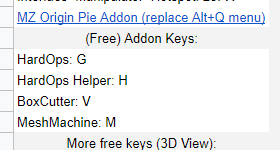 On the downside, you will have to remap them yourself, but luckily all these addons have keymap customization options. I wanted to keep it somewhat simple and familiar, so that’s why I did not include non modifier keys as modifier keys. It’s something people are not really used to so it’s not easy to figure out. I have Pan at MMB, Orbit at Alt+MMB and Zoom at Ctrl+MMB, here is my reasoning. By default, Blender in 3D view uses MMB for orbit, and Shift+MMB for pan. I don’t think that’s a good decision. If you think about it, when you are in perspective view, then you pan about as much as you orbit, but as soon as you get into any of the aligned views, such as front, left, top, etc… you can only really pan. You start to navigate in 2D only, and if you do orbit, it automatically ejects you from the view you want to stay in. So if panning is what you do all the time in those views, the it makes no sense to have to keep shift held any time you want to just look around in that 2D view. This becomes all the more useful for Grease Pencil, because there, people spend majority time working in 2D. And even in 3D view, when doing 3D work, I’ve noticed people generally tend to Pan more than Orbit. Agreed. I personally have my muscle memory hardened by Maya, so navigation is something that I won’t change, but you have solid reasoning behind that. Question about your keymap. I understand that it’s not yet complete, but I can’t seem to find the Material toggle F6. Although, beware that if you were to change to Maya style navigation in my keymap, you will likely break the loop selections in edit mode (Alt+LMB), Lasso selection (Alt+LMB drag) and Brush resize in all painting edit modes (Alt+RMB). EDIT: Post no longer relevant, the keymap is now finished. I’m aware. So far, they’ve been resolved. We’ll see if they last. For brush resize I’m using an addon that enables RMB drag. Now it works! Thank you so much dude, for offering this set - was fed up waiting for the official one, now blender feels more like home!!! This is great, I installed it without a hitch and will set it as the default keymap on all my machines. As a longtime 3ds max user I find it perfect! There is a part of me that really wants an alt+left to rotate view as in maya/unity since I find it easier on my wrist (and mmb life time) but I will avoid the temptation to change it for now. 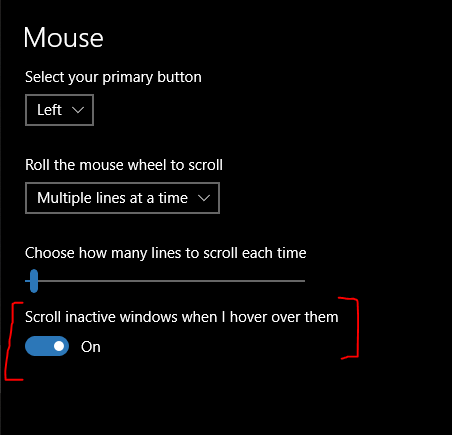 So far the only annoying part is that alt+mmb that doesn’t rotate view when coming back from a different window. Maybe you could put the config on a repository to keep people updated on changes? Additionally there is an industry standard keymap in the works, which hopefully will be out by the time 2.80 officially wraps up. I will have to get familiar with how repos work first Good idea though. If not, then it could be the reason.